Every summer when I was a little girl, we would travel to New Mexico to visit my grandmother. I always found myself in her kitchen, watching her every move. She made everything from scratch, which was not uncommon for her generation. She worked as a cook at a home for seniors, baking them bread each day and then she would come home and cook for us. One of my favorite recipes of hers, was her famous green chili and beans with a side of tortillas. My grandfather would skip the spoon and use the tortilla to scoop up the hearty meal. She didn’t follow a recipe and though I watched her meticulously countless times, I have never been able to quite master her green chili. 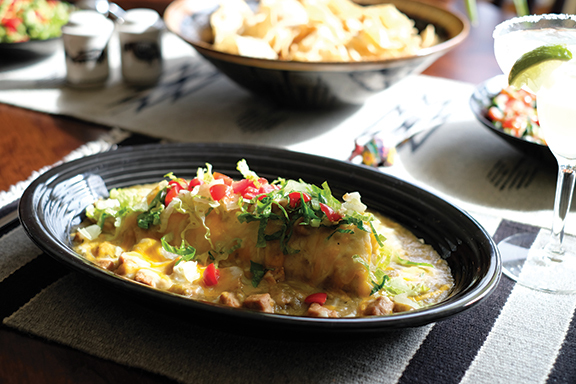 I have since adapted the recipe from a bowl entrée to these green chili burritos. I know that everyone thinks their grandmother is the “best cook”, but mi abuelita really WAS the best cook of all time. This meal would make the perfect Cinco de Mayo dinner. I hope you enjoy these and do Patricinia Mares proud. P.S. these pair nicely with a cold margarita, if you’re into that sort of thing. Cook the beans first, as they take the longest. Start by removing any small stones or dirt from beans. Rinse the beans in cold water until the water is no longer cloudy. Add 2 lbs. pinto beans and 1/2 chopped onion to a large, heavy pot, and cover beans with water, about 2 inches above the top of the beans. Cover the pot, bring to a boil and then remove from heat. Let the pot rest for 1 hour, covered. (This is called a 1-hr. quick soak.) Then, stir in 3 teaspoons of kosher salt, cover and bring to a boil (this won’t keep the beans from getting soft, promise). Take the cover off the pot, reduce heat to low and simmer until beans are tender, about 1-1 ½ hours. For the green chili, get your pan hot and add the oil, then add the diced meat and cook until it gets golden brown on the outside (don’t crowd the pan). Next we make a roux by adding flour and cook for another minute, then add the garlic. Deglaze the pan with the chicken stock and add green chili. Bring to a boil, then turn down the heat and simmer for 45-60 min. Preheat oven to 350 degrees. Spread beans on tortilla, add chopped onion, shredded cheese and roll. Smother with green chili and more cheese and place in oven until hot and bubbly. Garnish with shredded lettuce and diced tomatoes. Enjoy!